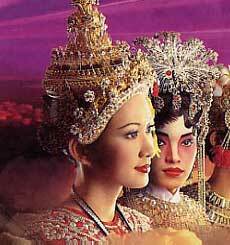 Thai Airways International is the national airline carrier of Thailand. A founding member of the Star Alliance network, Thai's main base is located at Suvarnabhumi Airport. There are a few long non-stop commercial flights which Thai offers such as flights from Bangkok to New York and to Los Angeles, California. The airline has achieved top position recently with Skytrax awarding it with the 'Worlds Best Cabin Staff' award in the year 2006 and second place in the 'Airline of the Year' category in 2007. Thai Airways Cargo has weekly cargo freighter aircraft service which flies 3 times a week (Bangkok - Dubai - Paris). Royal Orchid Plus is Thai Airways International's frequent flyer program. With the no of members close to over 2 million worldwide, 2 types of mile can be earned if you have an account namely the Eligible Qualifying Miles (EQM) and Qualifying Miles (Q Miles). Thai has four travel classes. They are Economy, Premium Economy, Royal Silk and Royal First. 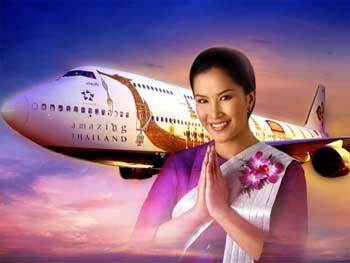 Thai Airways International consists of aircraft types of the following :- Aerospatiale/Alenia (All Series), Airbus A330-300, Boeing 747 Passenger (All Series), Aerospatiale/Alenia ATR72, Airbus A340, Boeing 747-400 Passenger, Airbus A300 (All Series), Airbus A340-500, Boeing 777, Airbus A300 600/600C, Airbus A340-600, Boeing 777-200, Airbus A330 (All Series), Boeing 737-400, Boeing 777-300 and Airbus A330-200. Check flight schedule, flight status directly from Thai Airways official website. You can also check on the cheapest airfare, flight schedule, flight status, airlines offices, contact number, airlines packages, air cargo partners, air ticket prices and booking procedure, international airfares, frequent flyer and other flight information and travel deals and packages. When you are making an airfare booking, select from either economy airfares, business class airfares or first class airfares whichever you prefer.